Fiber optic test equipment is a type of optoelectronic instrument used to evaluate the performance of fiber optic cables, components, and systems. Its major application is the installation and maintenance of fiber optic systems which is expected to remain so during the forecast period. The overall market is expected to grow from USD 678.9 Million in 2014 to USD 902.2 Million by 2020, at a CAGR of 4.86% during the forecast period (2015-2020). The market for fiber optic test equipment market used in data centers has been witnessing the fastest growth. The studied market in APAC is expected to witness the highest growth during the forecast period. The report includes the competitive landscape and company profiles of the key players such as JDS Uniphase Corporation (US), EXFO (Canada), Anritsu Corporation (Japan), Keysight Technologies (US), Fluke Networks (US), Corning Incorporated (U.S.), Yokogawa Electric Corporation (Japan), Kingfisher International Pty Ltd (Australia), AFL (U.S.), and Tektronix, Inc. (U.S.). This report would be useful for the leading operators, contractors, and OEMs in the market. Other parties that could benefit from the report include government bodies, consulting firms, business development executives, C-level employees, and VPs. Our report would help you analyze new opportunities and potential revenue sources and enhance your decision making process for new business strategies. The quantitative and qualitative information in the report along with our comprehensive analysis will help you stay competitive in the market. The Fiber optic test equipment market has been segmented based on the type into OTDR, OPM, OLS, OLTS, RFTS, and others (PWD, CD and tunable laser). The Fiber optic test equipment market has been segmented based on form factor into handheld/portable and bench top / rack mounted. The major applications of fiber optic test equipment include installation and maintenance, manufacturing, and research and development. 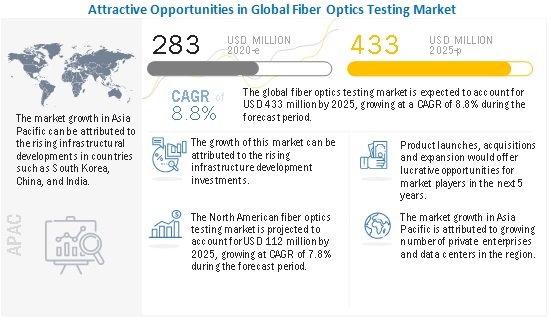 The fiber optic test equipment market has been segmented based on end-user into telecommunication and broadband, CATV, private enterprises, data centers, industries (oil and gas, military and aerospace, and others (electronics, medical, automotive, utility, and government). The fiber optic test equipment market has been segmented based on geography into North America (the U.S., Canada, and Mexico), Europe (Germany, the U.K., France, and others), APAC (China, India, Japan, South Korea, and others), and the rest of the world (the Middle East, South America, and Africa). The fiber optic test equipment market is used to test and measure the fiber network connectivity problems such as power loss, insertion loss, fiber breaks, and end-to-end loss. The increase in demand for higher bandwidth, transition to next-generation wired and cellular technologies, and growth of the telecommunications industry are some of the factors driving the demand for test and measurement equipment and solutions. The fiber optic test equipment can be broadly classified into OTDR, OLS, OPM, OLTS, and RFTS. The market for OLTS and RFTS is expected to grow at a high CAGR compared to other equipment. OLTS consists of both optical light source and power meter in the same unit that reduces the complexity of operation while RFTS helps in remotely testing the fiber optic system. The market for the telecommunication and broadband application is expected to account for the largest share of ~60% of the studied market. Many telecommunication companies use fiber optics to transmit telephone signals as well as internet communication and cable television signals. Due to much lower attenuation and interference, fiber optic has many advantages over existing copper wires in long-distance applications which are in-demand. The demand for broadband in FTTx as well as 4G and LTE mobile networks is driving the demand for fiber optic test equipment market. The overall Fiber optic test equipment market is expected to reach USD 902.18 Million by 2020, at an estimated CAGR of 4.86% between 2015 and 2020. The unit shipments for fiber optic test equipment are expected to grow at a CAGR of 13.64% from 2015 to 2020. The APAC region has the largest number of broadband connections worldwide and there is high penetration of fiber optic based network in this region which is expected to boost the demand for fiber optic test equipment in this region. Some of the major players in the market include JDS Uniphase Corporation (US), EXFO (Canada), Anritsu Corporation (Japan), Keysight Technologies (US), Fluke Networks (US), Corning Incorporated (U.S.), Yokogawa Electric Corporation (Japan), Kingfisher International Pty Ltd (Australia), AFL (U.S.), and Tektronix Inc. (U.S.).